Alfalfa, called the "Queen of the Forages," is the fourth most widely grown crop in the United States behind corn, wheat and soybeans and double the cotton acreage. Although there is no published value for alfalfa hay the estimated value is $8.1 billion. There are 23.6 million acres of alfalfa cut for hay with an average yield of 3.35 tons per acre. The estimated value of alfalfa hay is $102.50 per ton. Alfalfa meal and cubes are exported to other countries with a value of $49.4 million to the U.S. economy. Alfalfa is sometimes grown in mixtures with forage grasses and other legumes. The acreage of all hay harvested including alfalfa per year is 60.8 million with an estimated value of $13.4 billion. When the value of alfalfa as a mixture with other forages is considered the acreage and value of hay is approximately equal to wheat and soybeans. Alfalfa seed is primarily grown in the northwestern areas of the U.S. primarily in the states of California, Idaho, Nevada, Oregon, Wyoming, and Washington. The approximate yield of alfalfa seed in 1999 for the U.S. is 115 million pounds, with average price of $190 per 100 pounds of seed, thus the estimated value of alfalfa seed is $218.5 million. A fringe benefit to the production of alfalfa seed is the production of honey from bees. In the U.S., $147.7 million dollars worth of honey is produced each year. Alfalfa is also important due to its high biomass production. The record yield of one acre of alfalfa is 10 tons/acre (22 Mg/ha) without irrigation and 24 tons/acre (54Mg/ha) with irrigation. Alfalfa is a widely adapted crop, energy-efficient and an important source of biological nitrogen fixation. The average acre of alfalfa will fix about 200 kg of nitrogen per year, thus reducing the need to apply expensive nitrogen fertilizers. One of the most important characteristics of alfalfa is it's high nutritional quality as animal feed. Alfalfa contains between 15 to 22% crude protein as well as an excellent source of vitamins and minerals. Specifically, alfalfa contains vitamins A, D, E, K, U, C, B1, B2, B6, B12, Niacin, Panthothanic acid, Inocitole, Biotin, and Folic acid. Alfalfa also contains the following minerals: Phosphorus, Calcium, Potassium, Sodium, Chlorine, Sulfur, Magnesium, Copper, Manganese, Iron, Cobalt, Boron, and Molybdenum and trace elements such as Nickel, Lead, Strontium and Palladium. Alfalfa is also directly consumed by humans in the form of alfalfa sprouts. According to the International Sprout Growers there are approximately $250 million dollars worth of sprouts sold in North America. Alfalfa juice is used in some health food products. Alfalfa hay is used primarily as animal feed for dairy cows but also for horses, beef cattle, sheep, chickens, turkeys and other farm animals. The value of milk, meat, wool and all other animal products is $132 billion, thus the total value of animal products plus the value of hay reach the $145 billion level. This far exceeds the combined value of all other high value crops. In addition to the traditional uses of alfalfa as an animal feed, alfalfa is beginning to be used as a bio-fuel for the production of electricity, bioremediation of soils with high levels of nitrogen, and as a factory for the production of industrial enzymes such as lignin peroxidase, alpha-amylase, cellulase, and phytase. For a variety of small pets, the best diet you can offer them is one rich in Timothy Hay. Dried from a natural, perennial grass, Timothy Hay is inexpensive and healthy. It aids digestion and helps wear down the constantly growing teeth of rabbits and true herbivores, such as chinchillas and guinea pigs. Rabbits, chinchillas, and guinea pigs should be offered free access to large quantities of fresh timothy hay daily (young animals may have some Alfalfa Hay). Similarly, other small pets, such as hamsters and gerbils, should be given a small handful of hay two or three times a week. Timothy Hay should be an integral part of many small pets' diets. Timothy Hay is very fibrous. Therefore, it is essential for the proper functioning of your small pet's digestive system. As the chewed hay moves through the small and large intestine, the high fiber content aids in the passage of food. Timothy Hay should be the main food offered to your rabbit, chinchilla, or guinea pig. As your pet chews this herbivore-favorite food, it wears down and cleans their constantly growing cheek teeth, which are the large grinding teeth in the back of the mouth. To compensate for this wearing, cheek teeth have evolved to grow continuously throughout the animal's life. Therefore, keeping fresh Timothy Hay available to your rabbit or true herbivore small pet is essential to help wear down her teeth. Other chewing items such as chew sticks should also be provided. The diet of mainly Timothy Hay should be supplemented with fresh vegetables, a small amount of pellets and, of course, fresh water. As with most foods, no two hay types are identical in structure and nutrient content. This is especially true for Timothy Hay and Alfalfa Hay. Although both types of hay are frequently sold for small pets, each has its place in your pet's dietary needs and should not be substituted for one or another. Alfalfa Hay is rich in calories and calcium, while timothy hay is less-fattening and has much less calcium. Therefore, during the developmental stages of your rabbit's life or during her pregnancy, for example, Alfalfa Hay can be offered. But once a young animal reaches young adulthood (about 7 months of age in a rabbit), she should be switched to an almost strictly Timothy Hay diet, unless otherwise recommended by your veterinarian due to low body weight. Because of its versatility as both a dietary food and dental aid, Timothy Hay is a great food source for many small pets. At last, my order of hay ( Alfalfa and Timothy ) managed to arrived safely. It took 3 days to reached me. And also, I have 3 doe delivering litters today. 4+5+4= 13 active little bunnies. 4 From mix Lop Ear, 5 From Lionhead, and 4 from Local+Chincilla. But the heavy raining these few days make me worries, can the litters survives the coldness and the dampness ? Only time will tell. 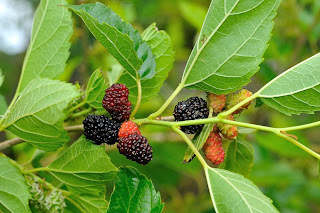 Mulberry (Morus spp), the traditional feed for the silk worm, has been selected and improved for leaf yield and quality in many environments and is spread throughout the world. 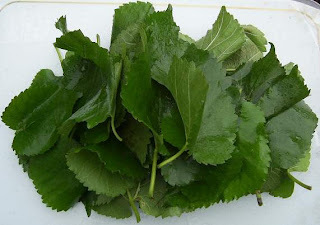 Mulberry leaves are highly palatable and digestible (70-90 %) to herbivorous animals and can also be fed to monogastrics. Protein content in the leaves and young stems, with a good essential amino acid profile, varies from 15 to 28 % depending on the variety. Mineral content is high and no anti-nutritional factors or toxic compounds have been identified. The establishment of this perennial forage is through stakes or seed, and it is harvested by leaf picking or cutting whole branches or stems. Yields depend on variety, location (monthly temperature, solar radiation and rainfall), plant density, fertilizer application and harvesting technique, but in terms of digestible nutrients, mulberry produces more than most traditional forages. The leaves can be used as supplements replacing concentrates for dairy cattle, as the main feed for goats, sheep and rabbits, and as in ingredient in monogastric diets. Mulberry (Morus spp.) leaves have been the traditional feed for the silk worm (Bombyx mori). There is evidence that sericulture started about 5,000 years ago (Huo Yongkang, South China Agricultural University, personal communication) and hence the domestication of mulberry. Mulberry has been selected and improved for leaf quality and yield for a long time. Through silk production projects, mulberry has been taken to countries all over the world, and it has now spread from the temperate areas of northwest and central Asia, Europe and North America, through the tropics of Asia, Africa and Latin America, to the southern hemisphere (southern Africa and South America). There are mulberry varieties for many environments, from sea level to altitudes of 4,000m (FAO, 1990), and from the humid tropics to semi-arid lands, like in the Near East with 250mm of annual rainfall and southwest of the U.S.A. (Tipton, 1994). Mulberry is also produced under irrigation. Although the majority of silk production projects have had limited duration due to silk processing constraints and limited market opportunities, mulberry trees have remained in most places where they had been introduced. 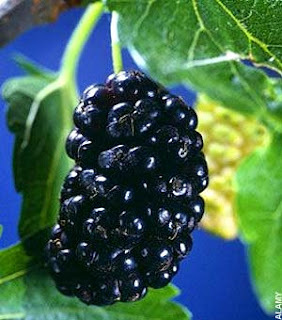 The main use of mulberry globally is as feed for the silk worm, but depending on the location, it is also appreciated for its fruit (consumed fresh, in juice or as preserves), as a delicious vegetable (young leaves and stems), for its medicinal properties in infusions (mulberry leaf tea), for landscaping and as animal feed. In Peru, the multiple uses of mulberry have been recognised (Zepeda, 1991). There are several places where mulberry is utilised traditionally as a feed in mixed forage diets for ruminants, like in certain areas of India, China and Afghanistan. In Italy there has been several studies on the use of mulberry for dairy cows and other domestic animals (Vezzani, 1938; Maymone et al, 1959; Bonciarelli and Santilocchi, 1980; Talamucci, and Pardini, 1993) and in France there was a research project to introduce mulberry in livestock production (Armand, 1995). But it was only in the eighties that specific interest in the intensive cultivation and use of mulberry as animal feed started in Latin America. It is surprising, that a plant which has been improved for leaf quality and yield to feed an animal, the silk worm, which has high nutritional feed requirements, received limited attention by livestock producers, technicians and researchers. Like several significant breakthroughs in science and technology, the discovery of the value of mulberry as a high quality feed in Latin America happened serendipitously. A Costa Rican farmer of Chinese origin, whose silk project failed, fed mulberry leaves to his goats and was impressed by its palatability and by the performance of his animals. He communicated his observations to scientist of the Tropical Agriculture Research and Training Center (CATIE), who were receptive to the farmer's news and smart enough to include mulberry in their tree fodder evaluations and later in agronomic and animal performance trials (J. Benavides, personal communication). In Africa, the International Centre for Research in Agroforestry (ICRAF) in Kenya and the Livestock Production Research Institute in Tanzania, have conducted successful agronomic and animal trials by themselves, apparently without being aware of the interest elsewhere. Mulberry belongs to the Moraceae Family (Subtype Angiosperms; Class Dicotyledons; Subclass Urticales) and there are several species: Morus alba, M. nigra, M. indica, M. laevigata, M. bombycis, etc. which have been used directly, or through crossings and induced mutations, for the development of varieties to support silk worm production. The diploid M. alba (2n=2x=28) is the species most widely spread, but polyploid varieties, which originated in various research stations in Asia, show greater leaf yields and quality. In general, polyploid varieties have thicker and larger leaves with darker green colour, and produce more leaves. There is a large variation in leaf production and in leaf quality (e.g. protein content) among the many species and in the varieties and cultivars grown at different locations under a wide range of soil and environmental conditions, indicating the huge potential for identifying suitable germoplasm for most sites. 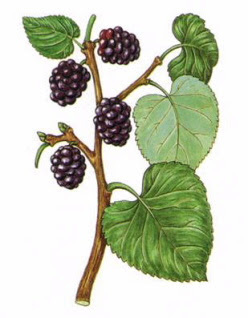 Many of the references on mulberry in the literature do not specify which species or varieties were used. Often, names are given based on leaf features. In many cases locally grown varieties (native or "criolla") seem to perform adequately, since they are probably well adapted to local conditions. Results of chemical composition of mulberry fractions from various authors are presented in Table 1. Crude protein content in leaves varies from as low as 15% to 28% depending on the variety, age of the leaves and growing conditions. In general, crude protein values can be considered similar to most legume forages. Fibre fractions are low in mulberry leaves compared to other foliages. Shayo (1997) reported lignin (acid detergent lignin) contents of 8.1% and 7.1% for leaves and bark, respectively. A striking feature of mulberry leaves is the mineral content, with ash values up to 25%. Typical calcium contents are around 1.8-2.4% and phosphorus 0.14-0.24%. Espinoza et al. (1999) found potassium values of 1.90-2.87% in leaves and 1.33-1.53% in young stems, and magnesium contents of 0.47-0.63% for leaves and 0.26-0.35% for young stems. Table 2 shows the digestibility of mulberry. As can be seen, leaf digestibilities in vivo (goats) and in vitroare very high (>80%) and total digestibility is equivalent to that of most tropical forages. The degradation characteristics of mulberry, determined by the nylon bag technique, are presented in Table 3. Leaves would be completely degraded if they remained in the rumen for enough time (Maymone et al 1959). 2 September 1982. 3 November 1983. The average amino acid composition and N content of 119 mulberry varieties grown experimentally in Japan (Machii, 1989) are presented in Table 4. Tryptophane was not included in the analysis. As can be seen from the data, essential amino acids are over 46 % of total amino acids. It can be calculated from the table that the average nitrogen (N) is 16.6% of the total molecular weight of the mulberry amino acids (plus ammonia), and thus the converting factor from N to mulberry protein is 6.02. The 204.3 mg of amino acids per g of protein is equivalent to 3.47% N, which is 80% of total N in mulberry leaves. Once tryptophane is subtracted, the difference, a non-protein fraction, is likely to be composed of nucleic acids and other unidentified N compounds. Table 4. Average amino acid composition and N content of mulberry varieties (Machii, 1989) and soybean meal (NRC, 1984). The most important protein in mulberry leaves, as in most leaves, is ribulose-1,5-bisphosphate carboxylase (RuBisCO) whose active site is responsible for carbon fixation (Kellogg & Juliano, 1997). Nitrogen in RuBisCO can be 43% of the total nitrogen in mulberry (Yamashita & Ohsawa, 1990). Palatability. One of the main features of mulberry as forage is its high palatability. Small ruminants avidly consume the fresh leaves and the young stems first, even if they have never been exposed to it before. Then, if the branches are offered unchopped, they might tear off and eat the bark. Cattle consume the whole biomass if it is finely chopped. There is a report (Jegou et al., 1994) of ad libitum dry matter intake of 4.18% of liveweight (average of three lactating goats), which is much higher than in other tree fodders. Jayal and Kehar (1962) reported dry matter intakes of mulberry leaves of 3.44% of body weight in sheep under experimental conditions. Animals initially prefer mulberry over other forages when they are offered simultaneously, and even dig through a pile of various forages to look for mulberry (Antonio Rota, FAO Barbados, personal communication). In a comparative study, Prasad and Reddy (1991) reported higher daily dry matter intakes of mulberry leaves in sheep than in goats (3.55 vs 2.74 kg DM/100kg body weight). Establishment. The most common planting method worldwide is by stem cuttings, but in certain places seed is preferred. As is the case with other tropical perennial forages for cut-and-carry systems, planting by seed assures deeper roots with greater capacity to find water and nutrients which eventually results in higher biomass production and greater longevity. Seeds might be the most acceptable way of transporting, quarantine and store selected materials. The advantages of stem reproduction (cloning) are certainty of production characteristics, practicality in obtaining the material and easiness of planting. Male plants might be preferred when introducing foreign germoplasm to new locations since this prevents involuntary expansion (Morgan P. Doran, University of California, Davis, U.S.A., personal communication). As in most perennial forages, the time and the establishment cost (mainly for land preparation, planting and weed control) are the critical aspects of the successful introduction of mulberry. Cultivation. Mulberry is cultivated for fruit as isolated trees or in orchards; for small scale silk worm rearing along the edges or along food crops in mixed farming systems; for large silk projects or for intensive forage production in pure stands; and also for forage in association with N-fixing legumes (Talamucci and Pardini, 1993; González and Mejía, 1994). Mulberry is also found mixed with other trees in natural forests or plantations. Fertilisation. All the required nutrients for mulberry growth must come from the soil, since it does not fix atmospheric nitrogen. In pure stands, mineral and organic fertilisers (animal and vegetable manures) must be used to replenish the nutrients removed with the foliage in order to maintain a sustainable production. The association with legumes with effective N-fixing rhizobium can reduce N inputs and may be the most desirable combination for some farms, but even when recycling nutrients in animal manures, extra chemical fertilisers are required for maximum yields (J.E. Benavides, personal communication). Responses of mulberry to N fertilisers have been clearly demonstrated, both in inorganic and organic forms, with better responses to the latter (Table 5). According to Kamimura et al. (1997), the nitrogen level in soils is the major factor for mulberry growth. Harvest and preservation. For silk worm feeding, individual leaf picking, shoot harvesting and whole branch cutting are practised, depending on the feed requirements of silk worm larvae stages and on harvesting costs (FAO, 1988). For silk worms leaves are offered fresh, but some other forms of feeding are being developed. For ruminant feeding, the preferred method has been branch cutting by hand, although one could envisage that mechanical harvesting could be employed in the future for direct feeding of fresh material on a large scale, for processing or for drying. Forage conservation by ensiling has been successfully achieved (Vallejo, 1995; González, 1996; cited by Benavides, 1999) and there have been some preliminary studies on leaf drying (Ojeda et al., 1998). Leaf blades dry within hours under full sun but more time is required for petioles and stems. Some conditioning (e.g. passing them through rollers) may help to reduce water content and minimise the deterioration of leaf quality by over exposure. Diploid varieties dry faster since they tend to have more stomata per unit of leaf area (Govindan et al., 1988). Table 5. Effect of goat manure or ammonium nitrate application on total dry matter yields during three consecutive years (Benavides et al., 1994). 2 Values with the same letter horizontally do not differ (p>0,001). Yields. The production of leaf and total dry matter per hectare of mulberry depends on the variety, on the location, on plant density, on fertiliser applications and on harvesting techniques. Table 6 presents the yields of mulberry in various locations. Total biomass yield and the leaf proportion vary with species and varieties. Climate (moisture and solar radiation) and soil fertility are determining factors on productivity (Espinoza et al., 1999). Increasing planting density increases leaf yields (Gong et al., 1995). Fresh leaf yields of 40 ton/ha /year (approximately 10 tons of dry matter) have been reported in India (Mehla et al., 1987) and in Costa Rica (Espinoza, 1999). Maximum dry matter yields of edible material (leaves and young stems) and total biomass were 15.5 and 45.2 tons/ha/year, respectively. Total leaf dry matter yields of less than 10 tons could be expected under less intensive production. Ruminants. Although the feeding value of mulberry for dairy cattle has been recognised for some time in Italy (Vezzani, 1938; Maymore et al., 1959) and it has been traditionally used in Himalayan countries, the research on mulberry for ruminants has been rather limited. Jayal and Kehar (1962), based on the high digestibility values of M. indica leaves, suggested that they could be used as supplements for lower quality forages. Mulberry was used to replace grain-based concentrates in lactating cows with excellent results (Table 7). Yields did not significantly decrease when 75% of the concentrate was replaced with mulberry. Milk production increased with the levels of mulberry offered to goats on a King grass diet (Rojas and Benavides, 1994) as shown in Figure 1. At CATIE (Turrialba, Costa Rica), a module of two dairy goats (Saanen x Toggenburg) being fed exclusively with forage from 775 m2 of mulberry (17,000 plants/ha), in association with Erytrina berteroana (5,128 trees/ha) just as green manure, and from 425 m2 of King grass, produced an average of 4 litres per day, equivalent to over 12,000 litres per ha/year (Oviedo et al., 1994). Also in Costa Rica, liveweight gains of bulls belonging to the Romosinuano breed (a criollo type) fed elephant grass, increased to over 900g/d when mulberry was offered as a supplement at 1.7% of their body weight on a DM basis (González, 1996 cited by Benavides, 1999). Table 8 presents the results of an experiment in Guatemala with growing Zebu x Brown Swiss steers being fed increasing levels of mulberry as supplement to a sorghum silage diet (Velázquez et al., 1994). Although the growing rates with the highest mulberry level are not impressive (195g/d), most likely due to the poor quality of the silage, this trial shows the high nutritive value of the supplement. Total intake and weight changes improved with the amount of mulberry offered reflecting its higher nutritive value compared to the basal diet. Daily gains of female calves (0-4 months) were not affected when mulberry leaves were offered ad libitum and the commercial concentrate reduced to 25% of the amount traditionally used (González y Mejía, 1994). In lambs, gains reached 100g/d when King grass was supplemented with 1.5% DM of mulberry (Benavides, 1986). Table 8. Effect of mulberry supplementation level on intake and weight changes of Zebu x Brown Swiss steers fed on sorghum silage (Velázquez et al, 1994). Monogastrics. The silk worm has a relatively simple digestive system, in certain ways it is comparable to that of the monogastric animals, thus, in theory, mulberry leaves could also be used at least as one of the ingredients in monogastric diets. In a trial with growing pigs in which a commercial concentrate was replaced by up to 20% by mulberry leaf (Trigueros and Villalta, 1997), the best level of substitution was 15%. It increased daily gains from 680g/d, with only concentrates, to 740g/d and also gave the best economic results. In rabbits, the reduction of concentrate offered daily from 110g to 17.5g with ad libitumfresh mulberry only reduced gains from 24 to 18g/d, but decreased to more than half the cost of the meat produced (Lara y Lara et al., 1998). The combination of mulberry and Trichantera gigantea leaves, as the protein source, and blocks made of molasses, cassava root meal and rice bran, as the energy source, gave better reproduction and growth performance than a diet of commercial concentrates and grass (Le Thu Ha et al., 1996). Singh et al. (1984) supplemented Angora rabbits, receiving pelleted diets, with mulberry leaves ad libitum and obtained intakes of mulberry equivalent to 29-38% of the total intake. This level significantly reduces feed cost. Deshmukh et al. (1993) fed mulberry leaves as the sole ration for adult rabbits. They found daily intakes of 68.5g for dry matter, 11.2g for crude protein and 175kcal for digestible energy (equivalent to 2.55Mcal of digestible energy per kg). The digestibility values were 74% for crude protein, 59% for crude fiber and 64% for dry matter. The authors concluded that mulberry leaves provided enough nutrients for maintenance. Narayana and Setty (1977) found better egg yolk colour and increased egg size and production with the inclusion (up to 6%) of shade-dried M. indica leaf meal in the mash of laying hens. Other small herbivores, like guinea pigs, iguanas and snails, could also be fed mulberry leaves. In fact, wild green iguanas (Iguana iguana) came to feed on recently established mulberry fields in Costa Rica (J.E. Benavides, personal communication). The traditional way of using mulberry as animal feed in silk producing areas is by providing ruminants with the residue left by the silk worm. A model of sericulture and milk production has been proposed by Mehlaet al. (1987), in which dairy cows receive mulberry residue and concentrates. The generation of edible protein and employment are much greater than with food grains. This refuse material is added to fishponds for herbivorous carps in the Chinese dyke-pond system, which is one of the most intensive agricultural low-input systems in the world, and generates food and outputs for a large number of people (Korn, 1996). In these silk areas, as well as where mulberry grows wild, cut-and-carry systems are practised and it is the most obvious way of utilising mulberry for livestock, either from pure stands or from associations with legumes (Benavides et al., 1995). Mulberry foliage can constitute the supplement to low quality forage (grass) based diets or as the main component of the ration. A natural association of mulberry and livestock occurs in regions (e.g Near East and Central Asia) where mulberry trees are kept for fruit production. Fallen leaves in the autumn are consumed by domestic animals. Since fruit ripening happens in late spring or early summer, it may be possible to harvest leaves for forage one or more times before the winter. The only suggestion of utilising mulberry for direct grazing came from Talamucci and Pardini (1993) who proposed a complementary association with clover (Trifolium subterraneum) for sheep and cattle grazing in Tuscany (Italy). Mulberry benefits from the N fixation by the clover and contributes with high quality forage during the summer. The association produces more forage over a longer period than the individual pure-stands. The net result of long selection and improvement of mulberry has been that it is comparable or better than many other forage plants in terms of nutritional value and yield of digestible nutrients per unit of area, specially in tropical environments. Yield, quality and availability worldwide, make mulberry a very important option to intensify livestock systems, especially in those places where enough nutrients can be applied to obtain maximum response in biomass production. The high mineral content of mulberry foliage should be specifically taken into account in nutrient recycling and fertilising schemes to prevent loss of soil fertility. Considering its high quality and palatability, mulberry should be relatively more valuable as a feed, the smaller the animals are. Under equal circumstances, stock with higher nutrient requirements (per kg of liveweight), should be given preference when feeding mulberry. Armand, D. et Meuret, M. 1995. Culture en sec et utilisation en élevage de Morus alba "kokuso 21"en provence. Rapport Final (1991-1994). Selection and utilization of cultivated fodder trees and shrubs in Mediterranean extensive livestock production systems. Institut National de la Recherche Agronomique, Avignon, France. Benavides, J. E. 1986. Efecto de diferentes niveles de suplementación con follaje de morera (Morus sp.) sobre el crecimiento y consumo de corderos alimentados con pasto (Pennisetum purpureum). En: Resumen de las investigaciones realizadas con rumiantes menores, cabras y ovejas. Proy. Sistemas de Producción Animal. CATIE, Turrialba, C.R. 1986. Serie Técnica. Inf. Técnico No. 67:40-42. Benavides, J.E. ; Lachaux, M. & Fuentes, M. 1994. Efecto de la aplicación de estiércol de cabra en el suelo sobre la calidad y producción de biomasa de Morera (Morus sp.). En: Benavides, J.E. Arboles y arbustos forrajeros en América Central. Volumen II. CATIE, Turrialba, Costa Rica. p495-514. Benavides, J.E. 1999. Utilización de la morera en sistemas de producción animal. En: Sánchez, M.D. & Rosales, M. Agroforestería para la producción animal en Latinoamérica. Memorias de la conferencia electrónica. Estudio FAO Producción y Sanidad Animal 143, FAO, Roma.275-281. Benavides, J.E. ; Esquivel, J. y Lozano, Esmeralda. 1995. Módulos agroforestales con cabras para la producción de leche. Guía técnica para extensionistas. Manual Técnico #18, CATIE, Turrialba. 56p. Bonciarelli, F. e Santilocchi, R. 1980. Primi risultati di prove con arbusti forraggeri da pascilo. Rivista di Agronomía (Italia) 14:21-29. Casoli, Carmen; Duranti, Emilia; Damiani, P. e Rongoni, V. 1986. Composizione chimica e valore nutritivo di foglie di Morus alba. Zootecnia e Nutrizione Animales (Italia) 12:47-54. Deshmukh, S.V. ; Pathak, N.V. & Takalikar, D.A. 1993. Nutritional effect of mulberry (Morus alba) leaves as sole ration of adult rabbits. World Rabbit Science 1(2):67-69. Espinoza, E.; Benavides J.E. y Ferreire, P.1999. Evaluación de tres variedades de morera (Morus alba) en tres sitios ecológicos de Costa Rica y bajo tres niveles de fertilización. Citado por Benavides, J.E., 1999. Esquivel, J., Benavides, J.E., Hernández, I., Vasconcelos, J., González, J., & Espinoza, E. 1996. Efecto de la sustitución de concentrado con Morera (Morus alba) sobre la producción de leche de vacas en pastoreo. En: Resúmenes. Taller Internacional "Los árboles en la producción ganadera". EEPF "Indio Hatuey", Matanzas, Cuba. p25. FAO. 1990. Sericulture training manual. FAO Agricultural Services Bulletin 80, Rome, 117p. FAO. 1988. Mulberry cultivation. FAO Agricultural Services Bulletin 73/1, Rome, 127p. Gong, L.; Ren, D.J. and Wang, Y. 1995. Studies on the solar ebergy utilization of mulberry fields with different planting densities. Sericologia 35(3):497-505. González, J. 1996. Evaluación de la calidad nutricional de la Morera (Morus sp.) fresca y ensilada, con bovinos de engorda. Tesis Mag. Sc. Turrialba, C.R. CATIE, 84p. González, E.; Delgado, Denia y Cáceres, O. 1998. Rendimiento, calidad y degradabilidd ruminal potencial de los principales nutrientes en el forraje de morera (Morus alba). En: Memorias III Taller Internacional Silvopastoril "Los árboles y arbustos en la ganadería". 25-27 de noviembre 1998. Estación Experimental de Pastos y Forrajes "Indio Hatuey", Matanzas, Cuba. p69-72. González, Sandra Eugenia y Mejía, I. 1994. Utilización de la morera (Morus indica) como reemplazo parcial del concentrado en la crianza de terneras. Tesis de grado, Facultad de Zootecnia, Universidad Nacional de Colombia, Palmira, Colombia. Govindan, R.; Narayanaswamy, T.K. & Magadum, S.B. 1988. Relative moisture loss from leaves of some mulberry varieties during storage. Current Research University of Agricultural sciences Bangalore 17(11):151-153. ITA#2. 1998. Introducción y evaluación de la morera en Yucatán, México. Informe Técnico del proyecto FAO. Instituto Tecnológico Agropecuario #2, Conkal, Yucatán, México. Jegou, D.; Waelput, J.J. & Brunschwig. 1994. Consumo y digestibilidad de la materia seca y del nitrógeno del follaje de Morera (Morus sp.) y Amapola (Malvabiscus arboreus) en cabras lactantes. En: Benavides, J. Arboles y arbustos forrajeros en América Central. Volumen I. CATIE, Turrialba, Costa Rica. p155-162. Kamimura, C.; Koga, S.; Hashimoto, A.; Matsuishi, N.; Torihama, Y.; Nishiguchi, T. and Shinohara, K. 1997. Studies on the factors influencing the mulberry (Morus alba) productivity in fields. Journal of Sericultural Science of Japan 66(3):176-191. Kellogg, E.A. & Juliano, N.D. 1997. The structure and function of RuBisCo and their implications for systematic studies. American Journal of Botany 84(3):413-428. Korn, M. 1996. The dike-pond concept: sustainable agriculture and nutrient recycling in China. Ambio 25(1):6-13. Lara y Lara, P.E. ; Sanginés G., R. & Dzib M., R. 1998. Utilización de hojas de morera (Morus alba) en la producción de carne de conejo. Memorias del IX Congreso Nacional de Investigación y Desarrollo Tecnológico Agropecuario. ITA#2, Conkal, Yucatán. p257. Le Thu Ha, Nguyen Quang Suc, Dinh Van Binh, Le Thi Bien and Preston, T.R. 1996. Replacing concentrates with molasses blocks and protein-rich tree leaves fro reproduction and growth of rabbits. Livestock Research for Rural Development. 8(3):33-37. National Research Council, 1984. Nutrient Requirements of Poultry. National Academy Press, Washington, 71p. Narayana, H. and Setty, S.V.S. 1977. Studies on the incorporation of mulberry leaves (Morus indica) in layers mash on health, production and egg quality. Indian Journal of Animal Science 47(4):212-215. Machii, H. 1989. Varietal differences of nitrogen and amino acid contents in mulberry leaves. Acta Sericologica et entomologica (Japan) 1, September, 1989, p51-61. Maymone, B.; Tiberio, M. e Triulzi, G.A. 1959. Richerche comparative sulla digeribilità delle foglie di gelso nelle larve di Bombyx mori e negli animali superiori. Annali dell'Istituto Sperimentale Zootecnico di Roma, Volume VI, Roma. Mehla, R.K.; Patel, R.K. and Tripathi, V.N. 1987. A model for sericulture and milk production. Agricultural Systems 25: 125-133. Ojeda, F.; Martí, J.; Martínez, Nereyda & Lajonchere, G. 1998. Harina de morera: un concentrado tropical. En:Memorias del III Taller Internacional Silvopastoril "Los árboles y arbustos en la gandería". Estación experimental de Pastos y Forrajes Indio Hatuey, Matanzas, Cuba 25-27 noviembre 1998. Oviedo, F.J.; Benavides, J.E. & Vallejo, M. 1994. Evaluación bioeconómica de un módulo agroforestal con cabras en el trópico húmedo. En: Benavides, J. Arboles y arbustos forrajeros en América Central. Volumen I. CATIE, Turrialba, Costa Rica. p601-629. Rodríguez, C.; Arias, R. & Quiñones, J. 1994. Efecto de la frecuencia de poda y el nivel de fertilización nitrogenada, sobre el rendimiento y calidad de la biomasa de morera (Morus spp.) en el trópico seco de Guatemala. En: Benavides, J.E. Arboles y arbustos forrajeros en América Central. CATIE, Turrilaba, Costa Rica. p515-529. Rojas, H. & Benavides, J.E. 1994. Producción de leche de cabras alimentadas con pasto y suplementadas con altos niveles de morera (Morus sp.). En: Benavides, J. Arboles y arbustos forrajeros en América Central. Volumen I. CATIE, Turrialba, Costa Rica. p305-317. Shayo, C.M. 1997. Uses, yield and nutritive value of mulberry (Morus alba) trees for ruminants in the semi-arid areas of central Tanzania. Tropical Grasslands 31(6):599-604. Singh, B.; Goel, G.C. and Negi, S.S. 1984. Effect of supplementing muberry (Morus alba) leaves ad libitum to concentrate diets of Angora rabbits on wool production. Journal of Applied Rabbit Research 7(4):156-160. Subba Rao, A.; Amrith Kumar, M.N. and Sampath, S.R. 1971. Studies on mulberry (Morus indica) leaf-stalk palatability, chemical composition and nutritive value. Indian Veterinary Journal 48:854-857. Talamucci, P. and Pardini, A. 1993. Possibility of combined utilization of Morus alba and Trifolium subterraneumin Tuscan Maremma (Italy) In: Management of mediterranean shrublands and related forage resources. REUR Technical Series 28, FAO, Rome, p206-209. Tipton, J. 1994. Relative drought resistance among selected southwestern landscape plants. Journal of Arboriculture 20(3):151-155. Trigueros, R.O. y Villalta, P. 1997. Evaluación del uso de follaje deshidratado de morera (Morus alba) en alimentación de cerdos de la raza Landrace en etapa de engorde. En: Resultados de Investigación, CENTA, El Salvador p150-155. Vallejo, M.A. 1995. Efecto del premarchitado y la adición de melaza sobre la calidad del ensilaje de diferentes follajes de árboles y arbustos tropicales. Tesis Mag. Sc. Turrialba, C.R., CATIE, 86p. Velázquez, Claudia M.; Gutiérrez, M.A. ; Arias, R.; y Rodríguez, .C. 1994. El forraje de Morera (Morus sp) como suplemento en dietas a base de ensilado de sorgo (Sorghum bicolor x S. sudanense) para novillos. En: Benavides, J.E. Arboles y arbustos forrajeros en América Central. CATIE, Turrilaba, Costa Rica. p377-392. Vezzani, V. 1938. La foglie di gelso nell'allimentazione delle vacche da latte. Annali della Sperimentazione agraria Volume XXIX, Ministerio dell'Agricoltura e delle Foreste, Roma. p7-17. Yamashita, T. & Ohsawa, R. 1990. Quantitative investigation on nitrogen metabolism in mulberry leaves. Bulletin of the National Institute of Sericultural and Entomological Science, Japan. March (1):27-44. Zepeda, J. 1991. El árbol de oro. Los mil usos de la morera. Medio Ambiente (Perú) 47:28-29. Mulberry: an exceptional forage available almost worldwide!